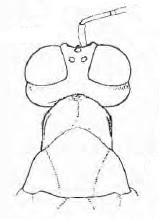 Dorsal view of head to mesoscutum of Thaumasura annulicornis, from Bouček (1988). Thaumasura is a genus of wasps found in south-east Asia and Australasia that develop as parasites of wood-boring beetle larvae. Adults are mainly found on dying or freshly felled trees (Bouček 1988). Characters (from Bouček 1988): Relatively large body size; coloration often metallic; females with gaster prolonged into a tail. Forewing often bearing a double infumation; head mostly almost as in grasshoppers, with large elongate (and mostly bare) eyes and swollen cheeks. Elongate eyes often bearing (especially when alive) cross-bands which partly coincide with metallic cross-bands on the face, changing often from blue-violet to red or dark purpureous, bright pale green to blue-green, combined with thick silvery pilosily. Antennae and legs slender but pronotum mostly only of moderate length. Notauli complete, narrowly groove-like, anterior margin of the scutellum straight. Gaster relatively slender, in the female the ovipositor always projecting and partly covered by the extended epipygium. Epipygium may be longer than gastral body and cover whole ovipositor but with the precercal part very short, or even much longer than gaster with the precercal part also very long and yet the sheaths still protruding far beyond the epipygium, or with the precercal part short and the postcercal part only little more than twice as long as the sixth tergite, with the ovipositor protruding beyond the epipygium.